As mentioned in a previous post, I often feel a slight twinge of disgust when I learn that literature I treasure is going to be morphed into a film adaptation. It’s not that I dislike the act of doing so as a concept; it’s just that the current body of film adaptations does not instill any hope that new ones will be any good. So imagine the horror and despair I felt when I learned that a former fashion designer (a field for which I do not have much respect) had adapted the most accomplished novel from my most revered writer into a new film? 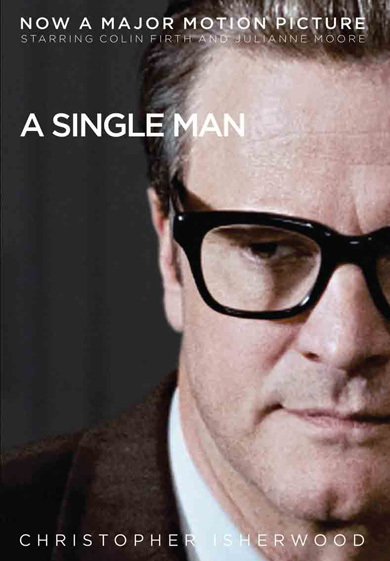 To my pleasant surprise however, Tom Ford’s rendition of Christopher Isherwood’s A Single Man was highly enjoyable to watch. And while I reserve some criticism around his choices in bringing this devastating story to the screen, I would recommend it overall, particularly for those of you who enjoy Isherwood’s work. It was refreshing to finally see Colin Firth as George break out of those interminable tethers to his famous presentation of Mr. Darcy from Pride & Prejudice, which he seemingly represents in nearly all of his roles. Julianne Moore, as George’s boozy British best friend, is also a delight, but that is nothing new. Ford manages to convey the power of Isherwood’s story: the ordinariness of George’s pain in losing his long time lover, suffocated underneath the cultural conservatism and fear rampant in mid-century America. In doing this, Ford seems to have done just fine with his film. What more can we ask? As originally determined from the film’s trailer, the visuals are stunning. Sometimes it almost reaches the point where I was not sure if I was watching a commercial for high end luxury products or a film. We can forgive Ford his indulgences, for he does give us imagery that is astounding overall and coaxes his actors into fine performances. I thought the New York Times review of the film did very well in comparing Ford’s work to that of Pedro Almodóvar and Wong Kar-Wai. This adaptation was tastefully done: any changes made to the story seemed natural in the transition from written word to moving screen image. Adding the gun and George’s desire to commit suicide gave the movie some dramatic impetus, which is needed in a film but can be left out of a piece of literature. My one main criticism has to do with the hyper-stylization of the film, even though I did find it gorgeous. Art directed to the maximum effect, Ford seems to pander to the materialistic and consumptive side of our culture in needing to make everything beautiful. The characters seem to be wealthier than represented in the novel, and everyone is so fashionable! But perhaps this is what audiences want to see, why would we want to be reminded of our drab lives? It just rings a little false in comparison to Isherwood’s original story, which was not glamorous. It seems like Ford did a great job of adapting the novel, but in bringing it to the screen put the entire thing before his personal fashion panel: anything that could be made pretty was done up, the whole tableau of visuals fit together too perfectly. Overall though, the film was a very pleasant surprise from an untested filmmaker, who managed not to crap all over a seminal work in modern queer literature. For this alone, Ford deserves praise. It will certainly be interesting to see what he does next with his new found path. Hopefully this wonderful novel will get a bit more attention now that the publishers have slapped Colin Firth’s mug on the cover for a re-print. Being an enthusiastic émigré from the greater Los Angeles area earlier in life, going back on the annual holiday-induced pilgrimage to visit family and friends is a loaded prospect nowadays. I have nothing short of the perplexing love/hate feeling towards Los Angeles, and this applies to the vast environs that are connected to it by the endless strips of concrete, box-stores, and neon lights that are the region’s highways. Namely, these are the 101 and the 118*, my links from Thousand Oaks to Los Angeles and the San Fernando Valley, popularly known as The Valley, respectively. The part that is always partially stunning is the amount of driving that needs to be undertaken while touring the region. Having given up my car years ago for the bus in San Francisco, I personally do not drive much these days and do not particularly enjoy being driven around. However, while in southern California, it’s simply not convenient to be riding public transit between the far flung points to which one may have to go. I typically arrive in an airplane, usually Southwest to Burbank, and get picked up by someone in a car. We drive to some other point in The Valley, or to the Conejo Valley, in which is nestled the sweet little city of Thousand Oaks. It is really just over a small range of hills, easily reached in your individual automobile pod along the 118. From my parents’ fortified suburban stronghold, there is no bus, there is certainly no train. We drive and drive to eat at restaurants or buy food to bring back and devour in time, usually under the auspices of holiday feastings. The hill and field which were once open space near the stronghold are quickly being devoured by new suburban bastions. Another disconcerting element of being in Thousand Oaks is the pristine silence that can be reached in the quiet hours of the night. I stand on the porch of my parents’ house and hear absolutely nothing. Sometimes you hear the baying of coyotes. Days are accorded to quality time with different people, whom I can usually only reach by car. I went from Thousand Oaks to Granada Hills (one of the many cities in The Valley!) to spend a day with my cousin and her French husband, a day of driving around and around, smoking and listening to music. We saw an old Cold War missile defense installation on top of a hill, restored unlike Hill 88 in Marin. 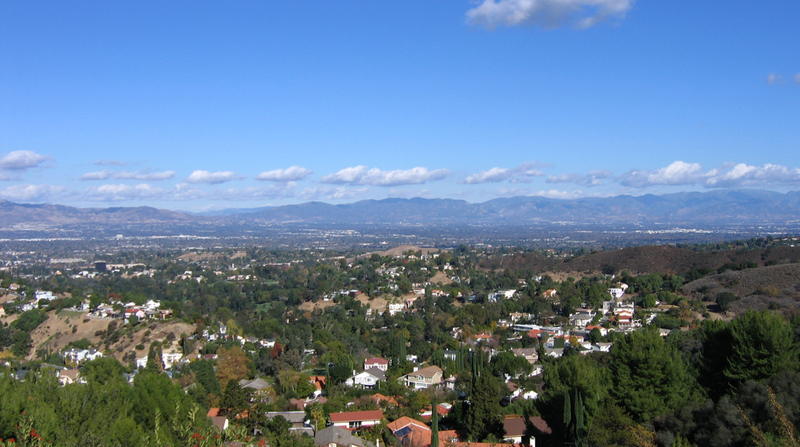 It necessitated a consideration of the sweeping views of the entire San Fernando Valley, gray and white with high clouds. We lost our minds and thought it a good idea to go to Griffith Park and see the view from the Observatory, which was a strategic mistake in having to deal with hordes of people and the automobiles which helped them carry out the mutual intention. The view of the Los Angeles cityscape was worth it though, as the lights of the valley sparked into flares consistently as the sun went down over the sea in the distance. The twinkling lights and incredible redness of the sky from the pollution fueled sunset burned in such a way as to unnerve me. The crimson dusk was ominous as we returned to the car, desiring beer to warm ourselves and limber our minds. The evening eventually brought us to what was described as one of the numerous dive bars dispensing libations in The Valley, a windowless hole which time had long since passed, Casey’s Tavern. Three dollar cocktails were brought to our boothed table by an ancient waitress. The transaction seemed to go one forever, but it was fine. New Year’s decorations festooned the drab interior, worn with years of use and smelling of it. In these moments, the boundary between love and hate is mixed. I feel at times warmth for the nostalgia of coming back to these southern California locales, memories of them built in childhood. Of course not Casey’s particularly, but these newly accessed spots add to the old. The height of the blend comes with driving around Granada Hills endlessly, passing the same nameless mini-malls with their precious individual parking lots in search of a madly Christmas-themed house, epic in proportions, at the whim of my cousin’s husband (a willing émigré from France to this place). Santa clung to a helicopter, loading spinning presents onto a western-themed wagon-sleigh, drawn by the reindeer, partially lifting off into the sky. Every other part of the house was covered in some sort of holiday piece or string of lights. A bench was provided for one to have a picture taken with the orgiastic display of Christmas spirit. My ambivalence comes from all these reminders of the place I left ten years ago, thrown into my face constantly by those that still connect me to this place. When this portion of the trip wraps up, I am driven to Union Station in Los Angeles, the disembarkation point of a train (a fresh relief as mentioned before) to the similar if slightly different, same-same but different, San Diego, for more days of driving around to culinary points of interest and passive hanging out activities. Most of this time is spent in Encinitas actually with friends and not in San Diego proper. The only time I see my charming public transit again is after the return flight to San Francisco. *I fully own my usage of the definite article along with the number of the highway in common vernacular and in writing.